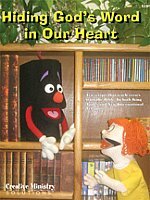 Super Fast Bible Stories is a collection of 9 puppet skits focusing on several important stories from the Bible. Buzz tells each story in a super fast way, while his buddy Toby helps him out. Ater they are done telling each story, the boys ask the audience several simple questions about what they just heard. The audience is encouraged to participate and shout the answers out. These skits offer a fun and simple way of communicating some of the basic facts about several key Bible stories. Each skit offers a lot of humor and encourages audience participation.